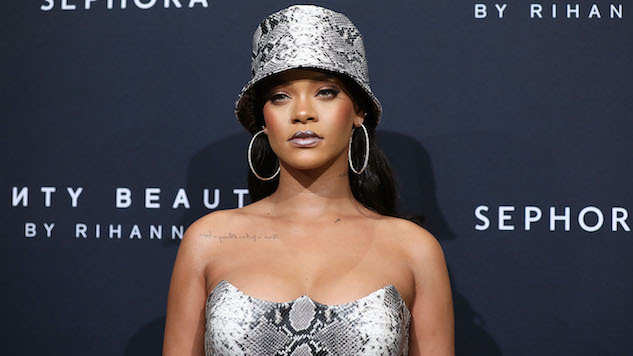 According to reports by US Weekly later verified by Rolling Stone, Rihanna turned down an offer to perform at 2019’s Super Bowl LIII halftime show in a show of solidarity with Colin Kaepernick. Kaepernick, the former quarterback of the San Francisco 49ers who has essentially been exiled from the league, first came under fire in 2016 when he kneeled during the National Anthem in protest of both racial inequality and police brutality. The decision proved to be polarizing, and the quarterback opted out of the final year of his contract with the team and hasn’t been signed to another since. Then, in November of 2017, Kaepernick filed a complaint against both the NFL and owners in the league, claiming there has been collusion aimed at keeping him off the field. Despite having released her most recent album, ANTI, back in 2016, Rihanna has remained in the spotlight, due in part to her massively popular makeup and clothing lines. According to US Weekly’s insider source, it is both her support of the quarterback and the NFL’s handling of the kneeling controversy overall that caused Rihanna to decline the offer. The halftime slot was then offered to Maroon 5, who accepted the position, according to reports emerging back in September. In addition, it has been rumored that Cardi B—after her feature on the band’s “Girls Like You”—might join in the performance. Neither Rihanna nor Kaepernick have commented publicly on the news.